Beautiful Boy was put on my radar after watching the haunting preview for the Timothee Chalamet and Steve Carrell fronted film adaption based on this book as well as Nic Sheff’s memoir, Tweak. When I was in college a friend of mine set me up with his childhood best friend after we hit it off at a small party. He wasn’t really my type looks wise but he was funny, lived in a apartment over his dad’s garage that house a dozen classic cars* and showered me with attention. After a few weeks our mutual friend warned me not to get too attached because his friend had a bit of a drug problem. His drug of choice? Meth. This was before Breaking Bad came out so I wasn’t even that aware of what exactly meth and tweaking was but I got a crash course over our two month relationship that included driving to a hotel in Dallas to drag my boyfriend home after he went MIA for three days and being stood up on my 21st birthday because my boyfriend hopped a plane to Vegas with some friends. Needless to say our relationship fizzled out. A year or so later my friend reached out to me that my ex had been sent to jail and was getting sober and would appreciate my writing to him. I wrote a generic “glad you’re getting help” email and received a response that was essentially a proposal. We haven’t talked since (and I dumped my so called friend too) but reading Beautiful Boy made me wonder how he is . 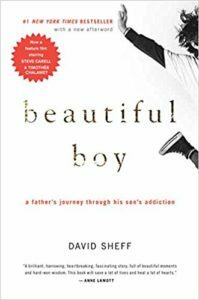 David Sheff’s memoir is about his son, Nic’s, struggle with drugs and alcohol. Nic’s drug of choice was also Meth. David is a journalist by trade so his memoir is well written though at times the writing is cloying and overwrought. David focuses on himself as much as he focuses on his son primarily his reactions to his son’s behavior and how they affected David, his second wife and their two children. It is an interesting take on addiction since many recovering addicts have written memoirs, Nic included, but there is less written by the loved ones of addicts. David and Nic’s mother got divorced when Nic was a toddler; Nic’s mother moved a couple hundred miles away so he spent the school year with his father and vacations with his mother. Sheff wonders aloud if the long distance custody arrangement, among other things, can be blamed for Nic’s problems but it is impossible to tell if the early trauma of divorce can be blamed. Nic got drunk for the first time before he turned thirteen and got in trouble as a freshman in high school for buying pot from a fellow student. In the present David struggles with whether or not these were typical “kids being curious” and experimenting or something more sinister brewing. David also talked a lot about his own drug use and posits he may have glamorized drugs, as well as shown you can do drugs and still be successful, instead of really warning his son against their dangers. There is no right or wrong way to parent and I’m sure any parent of an addict struggles with whether or not there was anything they could have done to prevent their child’s downfall. Nic goes in and out of rehab between the ages of 18 and 22 with stretches of sobriety in between. This is a heart wrenching read and you spend a lot of time wanting to wring both Nic and David’s necks. Nic because he is a drug addicted mess and David because he has a tendency to enable his son’s destructive behavior. There is an overarching message than you can become addicted to your loved one’s addiction which can be equally damaging to you both. According to Timothee Chalamet, who was on Fallon last night, Nic is sober and doing well today. Share the post "“A world of contradictions, wherein everything is gray and almost nothing is black and white.”"
Congratulations on your double Cannonball!